Philip Morris Korea Inc. on Monday opened its refurbished cigarette manufacturing factory in Yangsan, South Gyeongsang Province, the Korean unit of the international tobacco manufacturer said. The plant, which is equipped with raw material processing and packaging facilities, can produce 40 billion cigarettes per year, almost double that of the previous factory built in 2002. 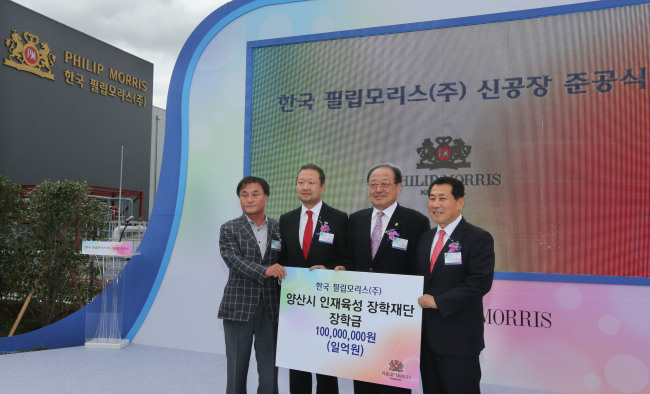 Philips Morris was the first multinational cigarette maker to have its own production line in Korea with an aim to better meet the tastes of local smokers. Investing 190 billion won ($170 million) in the expansion of the plant, the company said it has created 100 additional jobs for the neighboring community. “The construction of this new plant will enable PMKI not only to secure a stable production capacity and outstanding local talents, but also to contribute to the national economy by creating jobs and expanding exports to other countries,” said Chong Il-woo, managing director of PMKI. The opening ceremony was attended by some 150 guests, including the Korean head Chong, Yangsan City Mayor Na Dong-yeon and Philip Morris International’s senior vice president of operations Martin King. The PMKI factory, due to its environment-friendly management and efficiency, has also been named several times as the best quality control operation among Philip Morris’ some 60 manufacturing facilities around the world, officials said.